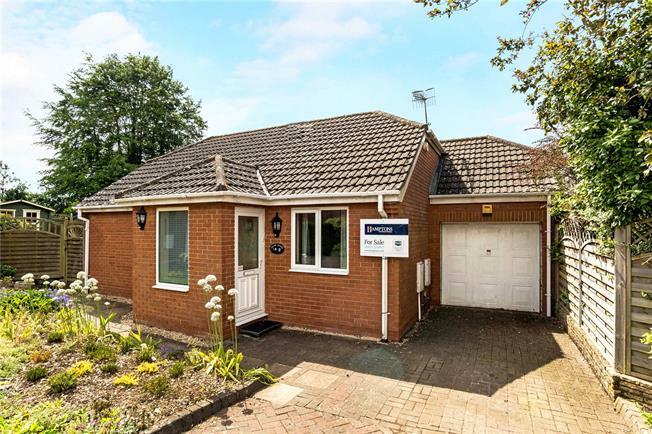 3 Bedroom Bungalow For Sale in Marlborough for Guide Price £380,000. A well presented three bedroom detached bungalow with an attractive south facing garden, garage and parking located a short distance from Marlborough town centre. This versatile home offers light and airy accommodation throughout with well proportioned rooms. The accommodation comprises of a spacious triple aspect sitting room with contemporary focal fire surround, the room splits naturally into dining area and benefits from French doors to the garden and adjoining sun terrace. The kitchen has an excellent range of cupboards and fitted with an integrated oven, ceramic hob and extractor fan. There is a lovely bright garden room off with sliding doors to the garden, this is an excellent space for use as a breakfast or family room. There are three bedrooms, one with wardrobes and cupboards and a recently updated family shower room. Elcot Nurseries is a small close and is situated on the favourable eastern edge of Marlborough within walking distance of the town centre; the historic market town provides an extensive range of shopping facilities, a twice weekly market, a library and various restaurants and pubs including the recently opened Rick Stein Restaurant and enjoys a good range of clubs and leisure facilities. The town is well served with excellent schools including Marlborough College, St John’s Academy, Dauntsey’s and St. Francis. Marlborough is well located for access to the M4 (junction 15 about 10 miles) and the commercial centre of Swindon is about 12 miles, from which there is a regular rail service to London Paddington and the South West. There are additional stations in Pewsey and Great Bedwyn, (both about 7 miles). The countryside surrounding Marlborough is a designated Area of Outstanding Natural Beauty and offers good walking, cycling and leisure opportunities particularly within the nearby and famous Savernake Forest. The house has parking in front of the attached garage, with side access to the rear garden with a pretty front border. The garden is a particular feature and has been beautifully landscaped with a large south facing sun terrace and is mainly laid to lawn with mature flower borders and with an additional decked patio area. There is a large workshop/home office fitted with light and power, a traditional style greenhouse and a further timber shed.